The city is far more than the gateway to Mallorca's beaches. Palma boasts one of the most well-preserved historic city centres in Europe with the stunning La Seu Cathedral acting as a major focal point. Other attractions include the Almudaina Royal Palace, which dates back to the 13th century, and the Es Baluard Museum of Contemporary Art. Palma is just as rich in shopping opportunities with the main shopping streets and Porto Pi shopping centres boasting well-known chains including Mango and Zara. For mid day meals/snacks go to 'Marina Port' located adjacent to the Tourist information Centre (cross dual carriageway in front of Hotel Costa Azul, turn right then walk alongside harbour for about 5 mins). Value for money, particularly Tapas or sea foods. Nice scenic location by the side of the Harbour. Definitely visit Palma Cathedral it has stunning architechture. Venture down the many side streets to look at the (expensive) Boutiques. However, if you choose to eat within one of the many restaurants by the Cathedral, be careful you are not over charged. One such establishment "Cafe S'Hort" charged 25 Euro for 2 Litres of beer!!! My wife & I were not impressed & reminded the waiter it is not advisable to rip off the tourists particularly under the current economic climate. Visit the caves of Drach or alternatively go on the old train to Soller. Finally, a special thanks to Fernando at the Tourist Information Centre by the Costa Azul. Very pleasant helpful and knowledgable person. 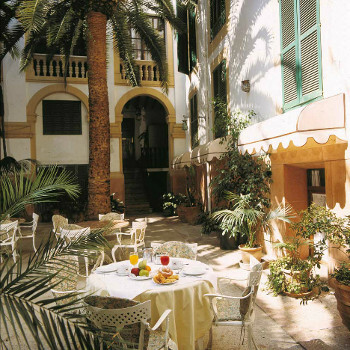 Palma is a fantastic place to stay beautiful harbour front splendid cathedral area. Local buses very good and clean. The new underground station is beautiful. The resort is very clean. There are more German than English bars. Get off the sea front and into the Spanish bars and they are a lot cheaper. Lots of entertainment at night for both young and older people. The beach is excellent. Great for shopping, lovely little cobbled streets. not many English bars seems all geared up to eating out. Lovely little tapas bars everywhere, has a nice Spanish feel to it. Up the road to the right is a good shopping marl named Porto Pi, worth a visit if you like shopping, it also has a large supermarket. Didn't find much nightlife, but enough bars to keep you going!! No beach area so not commented, the marina is stunning. This hotel has fab views onto the marina. Yes I would visit this resort again, best in winter though. have been to a few cities around the world and found that palma is one of the cleanest but it was winter time so might be different in height of summer.easy to get around-a trip on the big red bus is a must. I felt the walk into Palma very unpleasent avoiding all the dog excrement on the pavements (counted 17 droppings on a 15 minute walk into town) Other than this general cleanliness OK. I am sorry to say I was very disappointed with this resort and would not wish to visit again. I've based the beach standard on Illetes (think that's spelt right) beach. Get on the no3 bus. This was a small picturesque beach that we stayed at all day. I find it very hard to sit still all day so must've been good! We love Palma and can't wait to go back. It's got everything. Shopping, site seeing, beaches. What more do you want! We visited lots of other areas of Majorca, all of which very nice. The bus network from Palma takes you pretty much everywhere. Not sure I can comment on the resort entertainment. Probably not great for kids, but were plenty of bars around. We certainly weren't bored in Majorca for 2 weeks. The resort was very pleasant with clean and tidy beaches. The only difficulty I had was the inability to find people who could speak English. The area seemed to specialise in German guests and visitors and the local Spaniards semed to have a grasp of German but not English. This didn't spoil the holiday but it was quite entertaining hiring a car from a Spaniard who couln't understand me and I could't understand her. The resort itself is lovely best beaches I've seen in a long time and it's clean. Would visit resort again but not hotel.